I’ll try almost anything once, which is how I ended up in a dark warehouse down an even darker road in the middle of Cork City one Sunday night. A red glow crept out of the doorway and onto the ground outside as I approached the building and was directed in. I had reached the Circus Factory. Yes, it was all very dramatic at first, but the new premises of Cork’s member-led circus training space was quite lovely on the inside, if a bit difficult to find at first. We took our seats amid the sizeable, chattering audience while a jangly, remixed carnival soundtrack played in the background. We were here for the final night of Pitch’d, the Circus Factory’s inaugural festival which ran over three weekends in September. On the bill for the night were juggler-dancer Asaf Mor with the Irish premier of his show Nine to Five, an outstandingly energetic performance exploring the role of work in modern life, and ‘telepathy rockstar’ Edward James Dean – also known as Eddie Dean. Dean is currently in his third year of PhD research at University College Cork, focusing on “the psychology and performativity of psychophysical telepathy”. At the beginning of his performance, we had the privilege of hearing the first five minutes of his lecture on the topic, after which he promptly stripped down to his underwear to prove that he wasn’t wearing any sort of wire. I wasn’t sure if that was part of the lecture or not, because needless to say it’s something I’ve yet to see happen in Boole 1 (“it’s like you’re avoiding looking at him,” my companion said to me. “I’m just giving him a bit of privacy,” I responded). What followed was a thoroughly enjoyable, approximately two-hour long show during which Dean, a natural showman, presented his research in an extremely engaging and theatrical way, with plenty of audience participation throughout. According to his website, EdwardJamesDean.com Dean has previously headlined the National Circus Festival of Ireland as well as working with companies such as Heineken and the BBC. Alongside his theatrical work and lecturing at UCC, Dean has written a book, It’s the Thought That Kills, the plot of which is summarised in the blurb: “Helen poisoned him with her mind. Molly poisoned him with poison”. It’s amazing stuff, not least because he’s named the main character ‘Robert Errol Flynn’. Part of the plot was incorporated seamlessly into the performance itself – but I won’t give too much away. Dean’s rebellious, 1950s-style look worked incredibly well with this particular set, and the entire show was thoroughly aesthetically pleasing. It should also be noted that Eddie Dean, as a researcher and lecturer, is not attempting to present his work as a type of magic, but as a form of science; this meant that a lot of facts and figures were used throughout the show to back up his claims. While I didn’t have any means of fact-checking these claims at the time – I was in the front row, and that’s always an awkward place for a reviewer to sit; I feel like any note-taking will be distracting to the performer – it certainly sounded convincing, and was never dry in its presentation. Saying that, though, while Dean’s apparent mind-reading abilities are enthralling, I’m a skeptic at heart, and that’s something I had to repress slightly in order to fully enjoy the show. I say ‘slightly’ because, even for me, some of that stuff was mind-boggling. Regardless of your views on telepathy and parapsychology, this was an intriguing show, ably performed by a born showman. Whether it’s through his lectures in UCC or his circus-style performances, Eddie Dean is not a man to miss – although you may want to brush up on your mind-reading skills before you get there. 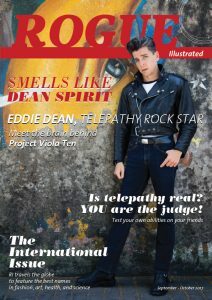 If you’d like to learn more about Eddie Dean, you can visit his website, EdwardJamesDean.com. Dean is also the star of the upcoming documentary, “Eddie Dean: Telepathy Rockstar”, due for release in February 2018. Next Next post: Big Data: Big Fear?